A man has been left totally devastated after he caught his cheating wife red-handed on CCTV having s*x with the gate man. 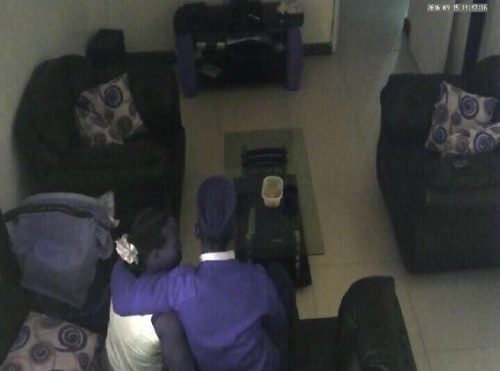 A husband who has been suspecting his wife of having an affair with the security man, has been left in total shock after he installed a Close Circuit Camera (CCTV) in his house because of his wife’s numerous denials. What he got in return has left him heartbroken. For the first few weeks, nothing unusual happens and you decide that you’ll stop watching the footage on a regular basis, Mpasho reveals. The man came back to see photos of his wife romancing and having s*x with the security man right in his parlour. The Nairobian man has now forced his wife out and threatened the security man for betraying his trust. In fact, the man is still bitter that his wife he trusted so much could condescend so much as to have an affair with the security man. The incident happened in Kenya.